Under today’s fast changing and dynamic environment, a corporation focusing just on internal controls and enterprise risk management are not enough. They are just part and parcel of our corporate defence management system. "Corporate defence can be defined as an alchemy of both science and art, aimed at defending a corporation from a multitude of possible threats and vulnerabilities." Defending your corporation includes defending the company’s name and all its stakeholders. This includes defending the shareholders, the business partners and of course its clients. Defending the company’s name also means defending its people, management and staff. Consequently, the defence of the organization is an extremely responsible station. The critical questions that must be raised are obvious ones. Where exactly does the responsibility for corporate defense rest within the organization, and who is accountable? The challenge of defending against threats and vulnerabilities is without end; it is a constantly evolving process that requires ongoing vigilance in order to ensure continuous improvement. It requires a strategic outlook and the alignment of a number of existing disciplines that need to be co-ordinated in a strategic manner. Organizations already implement a variety of what could be described as corporate defense-related disciplines. Each of these represents an important link in the chain to help corporations defend against internal and external threats. Unfortunately, very often these disciplines are not in alignment with one another and tend to operate in isolation (e.g., in silos) thereby creating vulnerability and reducing their potential for overall effectiveness. In order to achieve a holistic solution to corporate defense, the symbiotic relationship that exists between these disciplines must be understood and fully appreciated. 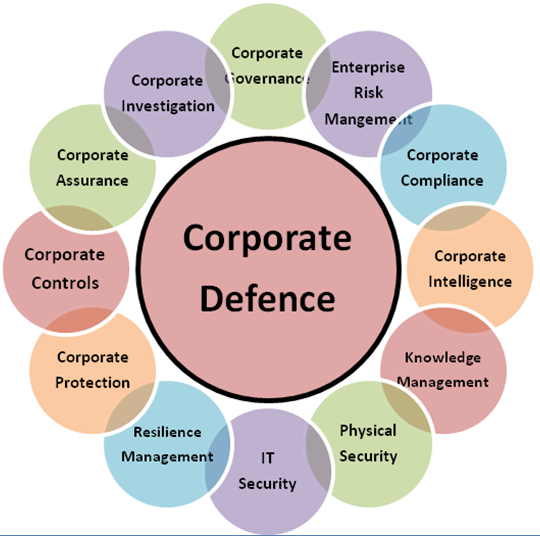 For corporate defense strategies to be effective, they must incorporate all of these disciplines in a co-ordinated and systematic manner. What needs to be created is a cybernetic loop whereby communication includes multidimensional feedback, operating vertically (both top down and bottom up) as well as horizontally. Falcon CPA's team has the skills, knowledge and expertise to help strategise your corporate defence issues and work together with your internal support team. Please feel free to contact us for a meeting.